A prize is awarded to a student in recognition of effort and preserverance in Greek and Roman Studies' subjects. In 2018 this prize was worth a $100 fee credit. A prize in memory of Catriona Cameron Bingham is awarded annually to an outstanding student in a beginning course in classical Greek. Preference will normally be given to a mature student. Selection of the recipient will be made by the Senate Committee on Awards upon the recommendation of the Department of Greek and Roman Studies. In 2018 this prize was worth $475 fee credit. Three of more prizes will be awarded annually by the Classical Association of Vancouver Island for excellence in the study of Classics. Selection will be made by the Senate Committee on Awards upon the recommendation of the Department of Greek and Roman Studies. In 2018 this prize was worth $75 towards purchase of a book. An award is given to a graduate student in either the Department of Greek and Roman Studies (even years) or the Faculty of Science (odd years). In 2018 this award was worth $4925. One or more bursaries are awarded to undergraduate students in the Department of Greek and Roman Studies. To apply, visit the Student Financial Aid and Awards website and select the "How to apply" tab. A scholarship will be awarded annually to an outstanding undergraduate student in Greek and Roman Studies. The winner is selected by the Senate Committee on Awards upon the recommendation of the Department of Greek and Roman Studies. In 2018, this scholarship was worth $2225.35. Award(s) of up to $6,000 available for undergraduate students registered in the Faculty of Humanities who are studying abroad through courses, field schools, or programs offered or recognized by the Faculty of Humanities. A scholarship will be awarded annually to an outstanding undergraduate student in Greek and Roman Studies, in memory of George P. Black, who was for 22 years an exceptional teacher of Latin and Greek at Victoria College. The recipient will be selected by the Senate Committee on Awards upon the recommendation of the Department of Greek and Roman Studies. In 2018 this scholarship was worth $950. One or more scholarships will support the academic work of outstanding graduate students in the Department of Greek and Roman Studies. In 2018 this scholarship was worth $1500. A scholarship is awarded to an academically outstanding undergraduate student who is enthusiastically pursuing a Major or Honours program in the Department of Greek and Roman Studies. Preference will be given to a student with financial need. In 2018 this scholarship was worth $1025. This scholarship is administered by the University of Victoria Foundation. the application must be made through completion of the in-course scholarship application on My Page. One or more scholarships will be awarded annually to an academically outstanding 4th year undergraduate student(s) in Greek and Roman Studies. The recipient(s) will be selected by the Senate Committee on Awards upon the recommendation of the Department of Greek and Roman Studies. In 2018 this scholarhsip was worth $1625. Award(s) of up to $500 available to assist with airfare and living expenses associated research activities conducted in international libraries, universities, or other related sites. Any undergraduate student registered in the Faculty of Humanities is eligible to apply. A book prize is awarded to the leading student in second year Latin. The prize is established by Gary Hayman in recognition of Irene Lee, his inspiring teacher of Latin at Mount Douglas High School. The recipient will be selected by the Senate Committee on Awards upon the recommendation of the Department of Greek and Roman Studies. In 2018 this prize was worth a $100 fee credit. The Jamie Cassels Undergraduate Research Awards (JCURA) was instituted in 2009-10 as the Undergraduate Research Scholarship program by the Vice-President Academic and Provost. It is designed to provide support for exceptional undergraduate students who might otherwise not be able to obtain a direct research experience as a part of what we anticipate should be a truly formative learning experience. Eligible students include all full-time 3rd and 4th year undergraduate students (normally registered in 12 or more units of study in the winter session) in excellent academic standing (normally this is a minimum sessional GPA requirement of 7.0) who satisfy the general regulations of Student Awards and Financial Aid. Each successful student receives $1,500 credited directly in their UVic account. The deadline for nominations is June 30 each year. The JCURA research presentation fair takes place in March each year. A scholarship is awarded to an outstanding graduate student studying ancient history in the Department of Greek and Roman Studies. Preference will be given to a student working in numismatics or with numismatic evidence. In 2018 this scholarship was worth $600. One or more scholarships are awarded to third or fourth year undergraduate student(s) or to a graduate student(s) in Greek and Roman Studies. 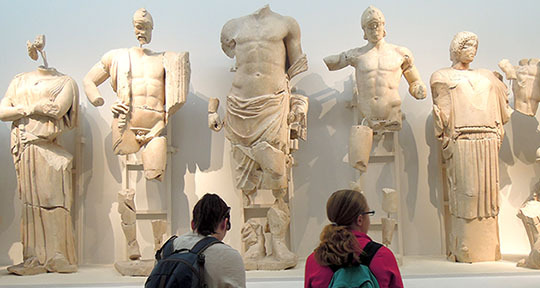 For undergraduate students, selection is made by the Senate Committee on Awards upon recommendation by Greek and Roman Studies; for Graduate students, selection is made by the Greek and Roman Studies Awards Committee. In 2018 this scholarship was worth $3275. One or more awards may be made annually on the basis of application to the Department. The funding for this award comes from an endowment generously provided by Mrs. Margareta von Rudloff of Victoria, the income of which is dedicated to supporting travel needs for graduate or upper-level undergraduate students taking their degrees in the Department of Greek and Roman Studies, by providing funds to deliver papers at conferences, to participate in special academic programs or archaeological excavations, or to visit libraries, museums, and classical sites. Applications should be submitted to the Chair, Department of Greek and Roman Studies by 15 February 2019. The result of the competition will be announced shortly thereafter. The Department reserves the right to make a single award, two or more separate awards, or no award at all if the number or quality of applications is deemed insufficient. Preference will be given to students majoring in Greek and Roman Studies and those who have not already received an award from this fund. Applications should consist of a letter explaining the purpose, date, and estimated cost of the trip envisaged, including a statement of approximately 250 words, describing the project and indicating what the applicant hopes to accomplish through the travel. One or more scholarships will be awarded annually to an outstanding undergraduate student(s) in Greek and Roman Studies who have: completed their 1st or 2nd year with an outstanding record in courses offered by Greek and Roman Studies, and have registered for further Greek and Roman Studies courses. The scholarship was established in honour of Peter L. Smith, who for many years was a member of this department. The recipient(s) will be selected by the Senate Committee on Awards upon the recommendation of the Department of Greek and Roman Studies. In 2018 this scholarship was worth $1550. A scholarship will be awarded annually to an academically outstanding undergraduate student who has completed year 3 in Greek and/or Latin studies in the Department of Greek and Roman Studies. The recipient will be selected by the Senate Committee on Awards upon the recommendation of the Department of Greek and Roman Studies. In 2018 this scholarship was worth $2650. One or more travel awards of at least $1000 each are awarded to undergraduate students who have declared a major in Greek and Roman Studies and who are enrolled in a field school, study tour or a study abroad course offered through the Department of Greek and Roman Studies, or approved by the department. The award will assist students with the costs of travel and\or fees associated with programs offered by the Department of Greek and Roman Studies. Students will be selected on the basis of a written proposal submitted to the department. The Department of Greek and Roman Studies invites applications for awards from the Robert J. Murphy Travel Award in Greek and Roman Studies. One or more of these awards of at least $1000 may be made annually on the basis of application to the Department. The income from this generous award is dedicated to supporting travel needs for undergraduate students who have a declared degree in Greek and Roman Studies; the award provides funds to assist financially students who are enrolled in a field school, study tour or a study abroad course offered through the Department of Greek and Roman Studies, or approved by the Department. A limited amount of funds will be available. Applications should be submitted to Dr. Ingrid E. Holmberg, Chair, Department of Greek and Roman Studies by 1 March 2019 (ingrid@uvic.ca). The result of the competition will be announced shortly thereafter. The Department reserves the right to make a single award, two or more separate awards, or no award at all, if the number or quality of applications is deemed insufficient. Applications should consist of a letter explaining the purpose, date, and estimated cost of the trip, including a statement of approximately 250 words, which describes what the applicant hopes to accomplish through the travel. Adjudication by the Advisry Committee to the Associate Dean Academic will take place in early October. In 2016-17 the award was worth $1,325.